Current economic analysis and theory pays little attention to the actual locations in which economic activity is taking place. The benefits of a particular location include factors such as inherent fertility or proximity to natural resources, but the largest factor in a trading economy is that the work of the whole community confers a great advantage on particular locations. If individuals, firms or nations are allowed to claim this for themselves the result is a large, unfair and ever increasing disparity in wealth, unemployment and civil unrest. This article introduces a quantified analysis of the economic potential of the major countries in Europe. It describes how these changed with the formation of the EEC and subsequently the EU, and shows how this effect provides riches for some and condemns others to poverty. The paper also describes how this unfair advantage is exacerbated by the Euro. Finally some possible solutions to correct this error and provide an equal opportunity for all to prosper will be outlined. The original work on Location Theory is accredited to Von Thunen (1783-1850) a north German academic with formal scientific training and practical experience as a farmer. He was interested in whether there was a natural location for particular forms of endeavour. For the next century these ideas were developed in North America, especially with a view to determining the best location for new industries. In the 1950’s Prof. Colin Clark was introduced to these ideas and he developed them further. He implemented a major project to determine the effect on the UK manufacturing industries of joining the EEC and the results of which are outlined here. Clark considered the original 6 members of the EEC (Western Germany, France, Holland, Belgium, Italy and Luxembourg) and the UK and divided them into 103 regions. For each region the economic potential was assessed as a function of the income in that region, the transport costs to and from every other region, prevailing tariffs and a minimum cost per load due to handling and distribution. A 10-ton load was the unit distributed and a minimum cost was added in for handling and distribution irrespective of distance travelled. Road, rail and sea transport were included but not the use of canals, and finally an allowance made for trade with other European nations and the rest of the world. The economic potentials calculated were rounded to a 200 unit spacing and lines of equal potential joined to form Isotims and drawn on a map of Europe. The first case considered was the economic potential of the regions within the 7 nations before the formation of the EEC, see map 1 above. The numbers are relative not absolute, and the largest is best. 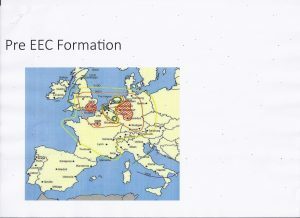 West Germany, France and Britain all contain a well-defined core region with potentials of over 2,800, with potentials decreasing with distance away from these core regions. It is notable that Belgium, Holland and Luxembourg have low potential, and southern Italy, Northern Ireland and Northern Scotland have potentials less than half of the maximum. Map 2 shows the economic potentials of the EEC with an independent UK. The EEC now shows a single core of greatly increased potential, 3,600 and to a lesser extent improvements in all other regions of the community. 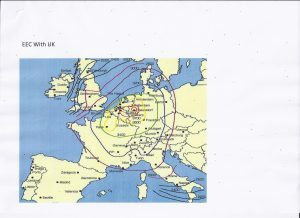 However, it is worth noting that Southern Italy and Southern France have declined in relative terms with respect to the large high potential core that now exists in Germany and parts of Holland. The greatest changes in potential have taken place in the Benelux countries with an increase in potential of over 50%. The absolute values in the UK have not changed significantly but the position relative to the new high potential core in Europe has reduced dramatically. 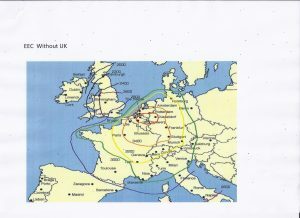 The enhanced potential of the Benelux countries compared with London signalled the decline of the Port of London and the growth of Antwerp and Rotterdam. Map 3 predicts the change in economic potentials due to the enlargement of the EEC to include Britain, Eire, Denmark and Norway (though Norway did not join ultimately). The UK gains a little but the major effect is an expansion of the areas of high economic potential in Europe. The UK now has a slight edge over Italy. Based on this map, Colin Clark’s prediction was that labour and capital would migrate to the areas of highest potential which would be steadily enriched and the periphery correspondingly impoverished. This was cross-checked against employment figures and it was seen that the regions with the highest potential values have experience the greatest increase in employment. From Map.1 it can be seen that prior to the formation of the EEC the manufacturing potential of the UK and Germany were roughly equal. The relative changes in the UK and Germany from this situation to Map 3, the EEC plus the UK are significant. Assuming equal skill and effort are deployed in each country the remuneration in the UK has increased by 8% whilst that in Germany has gone up by 36%. Assuming labour takes 25%, then the increase in profit and wages in the UK will have gone up by 12% and 4% whilst in Germany corresponding increases are 54% and 18%. This provides Germany with a level of profit that would support a strong government and infrastructure investment and enable manufacturing industry to use the latest machinery. Thus the labour cost per unit output from 2000 to 2009 has been flat in Germany whilst in Italy and Spain it has gone up by 30%. This results in goods produced in Germany being extremely good value and sales to their European neighbours are now 75% of Germany’s export success. In the more peripheral countries there is a corresponding loss of manufacturing jobs, lower tax revenues and more unemployed people to feed. Personal and public borrowing (from Germany) then increases to buy German goods. Clearly this is not a sustainable situation. Before the establishment of the Euro the nation states each managed their own currency.They could set their own interest rates, moderated their own money supply, and step in if the market set exchange rate was deemed too disadvantageous. In this era Germany’s locational advantage could be corrected from time to time by a national currency devaluation or more frequently revaluation of the D Mark, and the national governments local issues could be addressed with the fiscal and monetary tools available. Once the Euro was established the international exchange rate and interest rates were set by the stronger economic regions via the European Central Bank (ECB), and the cost of borrowing was uniform across both strong and weak economies. As the competitiveness of the peripheral nations started to decline the traditional exchange rate correction was not available and personal and public debt started to accumulate. The effect of the single currency persists today and in the authors view an orderly and well-timed dismantling of the Euro is necessary. This would provide a safety valve but would not give economic justice. The fundamental issue is that some regions enjoy an enormous advantage due to their position with respect to the surrounding regions. This is true on a national, European and global level. In the UK, London and the South East have a far greater economic potential than Northern Scotland, West Wales or Cornwall. However, starvation and riots are avoided by a tax system that redistributes income from the wealthy centre to the regions that are less well off. Some advocate a similar system for a politically unified Europe, but a brief look at the detailed working of the system in the UK would show that the resultant dependency culture, anomalies and immense bureaucratic overhead of such a system are highly undesirable. In addition most of these taxes fall on productive enterprise and are often the cause of failure of marginal businesses, causing further unemployment and an increased charge upon the state. In contrast to this a system that addresses the core issue of locational advantage is one that assesses said advantage and charges a levy on that alone. This levy would enable taxes on productive effort to be reduced substantially or removed altogether, increasing employment and reducing some of the need for government funding. To work across Europe this would require a levy on locational advantage to be collected and redistributed both on a national and pan national basis to provide the necessary funds for government, and get all of Europe working for a fair reward.